This perfect weeknight dinner is all cooked in one pan! 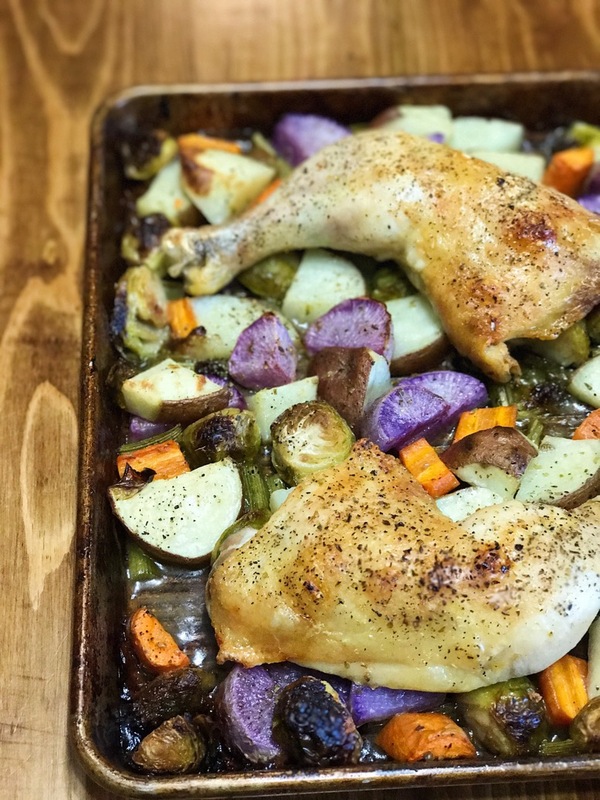 Lemon Butter Chicken with Potatoes & Vegetables is paleo friendly, gluten free, easy and delicious! Happy Friday!! Thank you all SO much for your sweet comments from Wednesday's post. Alright to the recipe! Today's recipe is one of my favorite go-to meals. To make this recipe you need whatever veggies you have on hand, chicken legs, ghee or butter, heavy cream (or coconut cream) and spices! You mix the sauce with the veggies, pour it on a baking sheet, add the chicken legs on top, bake and BOOM. Dinner complete! You can make this with chicken breasts, but I encourage you to cook it with skin-on chicken legs. There is amazing nutrients within the skin and in the cartilage and bones of the meat. So not only will your meat be more tender and delicious (especially because its cooked in a butter and heavy cream!) but it will also be full of nutrition! I know you guys get tired of hearing me say this but DO NOT FEAR THE FATS. They make food so utterly delicious, so satisfying, filling and so nutritious! In a small bowl, mix together heavy cream (or coconut cream), melted butter or ghee, oregano, lemon zest, lemon juice and sea salt. Set aside. In a large bowl, add the chopped vegetables and then pour the sauce mixture and mix to combine. Pour vegetable mixture onto baking sheet. Add the chicken legs on top and add additional sea salt to the chicken legs. Cook the meal for 45-50 minutes or until the chicken reaches an internal temperature to 165 degrees F and the vegetables are thoroughly cooked. Let the meal cool for approximately five minutes and then enjoy! I hope you guys have a wonderful weekend! I will be working most of the weekend, but am going to make sure to take some time off on Sunday to go to the beach with friends. Oh Florida, I love you. See you back on Monday!